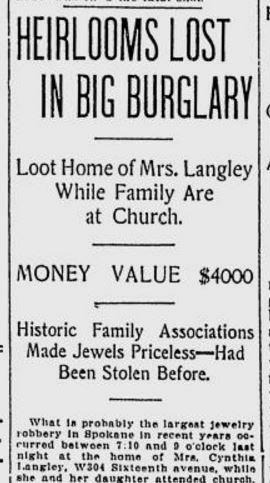 Mrs. Cynthia Langley was attending church with her daughter when a burglar crept into her house at 304 W. 16th Avenue and pulled off what was probably Spokane’s biggest jewel heist. The burglar jimmied open a bedroom window, ransacked the bedrooms and broke open a trunk and several jewelry cases. He hit the jackpot. He made off with dozens of diamond stickpins, Tiffany rings and watches. One ring alone contained nine diamonds and seven rubies. Many of the stolen items had historic significance, including a two-carat diamond brooch which Mrs. Langley said was given to her by Admiral Robert E. Peary while he was returning from his famous North Pole expedition. She said she was on board the steamer that met the explorer. She said that one of the stolen jewels had been given to her husband, the late Dr. Langley, by a member of the “royal family of Canada” (whoever that might be). It once belonged to the Duchess of Marlboro, Consuelo Vanderbilt. She also said that several stolen cameos had been brought to America by her ancestors in 1620 on the Mayflower. Police said she had no theft insurance. She was “on the verge of a nervous breakdown” and was sending all of her remaining jewels to a safety deposit box.